“BULLETS TO BALLOTS: Voting Rights Legacy of the United States Colored Troops”. Home/“BULLETS TO BALLOTS: Voting Rights Legacy of the United States Colored Troops”. Attend this free talk by Asa Gordon, founder and executive director of the Douglass Institute of Government (DIG). This program will be at at John Wesley Church (40125 Bond Street Waterford, VA) February 17, 2018 at 3:30. Parking is available at the Old School at 40222 Fairfax Street Waterford, VA. 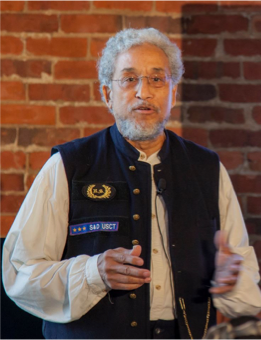 This presentation will focus on the impact of the advocacy of Black Civil War veterans, Freedmen and their White congressional allies in the post civil war reconstitution of the nation in alignment with the nation’s founding DECLARATION. The presentation is inspired by, and will hi-light new prototype exhibits that will be featured at the African American Civil War Museum (Wash. DC).